Garamba National Park is among the top places in the world that you can visit for the white rhino tracking , Garamba national park is located in the Orientale Province of the Democratic Republic of Congo . Its among the oldest national parks in Africa apart from Virunga National Park that was created in 1925 and odzala national park created in 1935 in central African region, Garamba National park was created in 1938 and the tourists activities havent boomed in Garamba national park due to the poor transport means within the region and low development in democratic republic of congo. Garamba National park is listed among the UNESCO world Heritage Site due to the fact that its home for the endangered species of the white rhinos which are increasing becoming extrinsic in the world. Garamba national park is hosting other wildlife animals like the African Forest elephants, Bush pig and leopard that’s why its among the top recommended congo wildlife safari destination as according to Congo National Parks Guide, the official travel guide listing all Congo parks with travel info of getting around, when to visit. Garamba National park is located in the North Eastern part of the Democratic Republic of Congo in the transition zone between the vast tropical forests of the Congo basin and the Guinea- Sudan savannas. The Park comprises of the last worldwide population of the Northern white rhino,endemic-subspecies of Congolese giraffe and a mixed population of elephants, which include forest elephants, bush elephants.The park’s vast savanna , grasslands and woodlands, distributed with gallery forests along the river banks and the swampy depressions, are home to four large mammals: the elephant, giraffe, hippopotamus and above all the white rhinoceros. 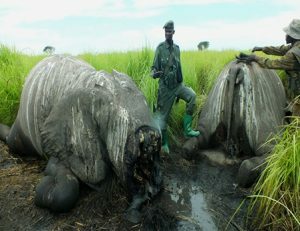 Garamba was home to the world’s last known wild population of northern white rhinos, but it has suffered greatly from Congo’s decades-long civil war, with heavy poaching and 50,000 refugees fleeing from Sudan into the park. The last white rhinos were likely killed by poachers by 2008, and the species is expected to be announced extinct within the next few years. Rhinos,less the park remains one of the last true wilderness areas of Africa, and its jungles and Savannah remain true wonders to be held. It has been predicted that the northern white rhinos would soon be declared extinct due to high levels of poaching in Garamba National park. As civil unrest hindered conservation efforts, plans were developed to transition the rhino to havens in Kenya but were not implemented — the Congolese argued that outsiders should not be allowed to take away their symbol. 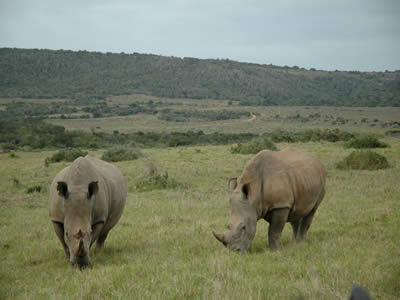 Only four individuals were recorded in an aerial survey of the park in 2005 but they were presumed dead due to the civil unrest in the area. Garamba National Park is surrounded by three vast adjacent hunting grounds, constituting an ecosystem of a sufficiently extensive area (1,242,700 ha) to support large populations of large mammals with their local seasonal migration routes. The hunting grounds contribute towards the effective protection of the property against the threats from the surrounding zone. Good luck. First, You must find a domestic flight to Aru, at which point they will have to switch to a charter prop plane for a 50 minute ride to Nagero, the launch point for expeditions into the park. It’s theoretically possible to travel by land from Aru to Nagero, but you would have to be crazy to try, both due to the impassibility of the roads. In garamba national park the top most things to do include the wildlife game drive , Guided Nature walks , Community visits , book congo wildlife safari adventure to explore the great Garamba national park congo with most experienced tour operators in Democratic republic of congo .